That's why a 2-year loan to the U.S. government will only net you 0.22%, a rate that is far below even the official rate of inflation. In other words, loan the U.S. government $10,000,000 and you will receive just $22,000 per year for your efforts and lose wealth in the process because inflation reduced the value of your $10,000,000 by $130,000 per year. After the two years is up, you are up $44,000 but out $260,000, for net loss of $216,000. That wealth, or purchasing power, did not just vanish: It was taken by the process of inflation and transferred to someone else. But to whom did it go? There's no easy answer for that, but the basic answer is that it went to those closest to the printing press. It went to the government itself, which spent your $10,000,000 loan the instant you made it, and it went to the financiers who play the leveraged game of money who happen to be closest to the Fed's printing press. This almost completely explains why the gap between the rich and everyone else is widening so rapidly, and why financiers now populate the top of every Forbes 400 list. There is no mystery, just a process of wealth transfer of magnificent and historic proportions; one that has been repeated dozens of times throughout history. 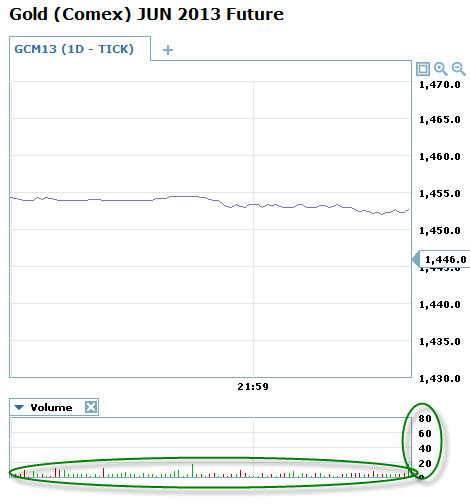 A while back, I noted to Adam that the gold slams that were first detected back in January were among the weakest I'd ever seen. 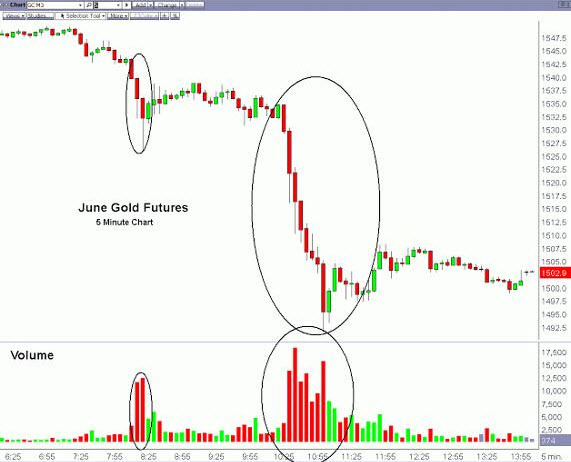 Back then I was seeing the usual pattern of late-night, thin-market futures dumping, which I had seen before in 2008 and 2011, two other periods when precious metals were slammed hard. The process is simple enough to understand; if you want to move the price down for any asset, your best results will happen in a thin market when there's not a lot of participation so that whatever volume you supply has a chance of wiping out whatever bids are sitting on the books. It is in those dark hours that the market-makers just dump, preferably as fast as possible. This is exactly what I saw repeatedly leading up to Friday's epic dump-fest. The mainstream media (MSM), for its part, fully supports these practices by failing to even note them. The CFTC has never once commented on the practice, and we all know that central banks support a well-contained precious metals (PM) price because they are actively trying to build confidence in their fiat money and rising PM prices serve to reduce confidence. There are two things to note in these snippets. The first is that the main ideas being promoted about gold are that it is no longer to be trusted and that somehow the recent move is a result of "risk off" decisions – meaning, conversely, that there is increased trust in the larger financial markets that 'investors' are rotating towards. Note that these ideas are exactly the sort of messages that central bankers quite desperately want to have conveyed. The second observation is even more interesting, namely that the only people quoted work directly for the largest bullion banks in the world. 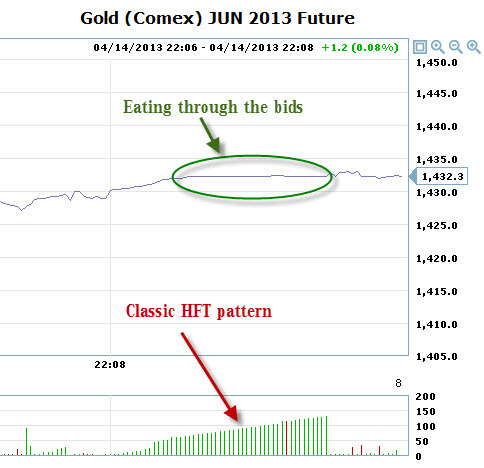 These are the very same outfits that stood to gain enormously if precious metals dropped in price. Of course they are thrilled with the recent sell off. They made billions. In February, Credit Suisse 'predicted' that the gold market had peaked, SocGen said the end of the gold era was upon us, and recently Goldman Sachs told everyone to short the metal. While that's somewhat interesting, you should first know that the largest bullion banks had amassed huge short positions in precious metals by January. 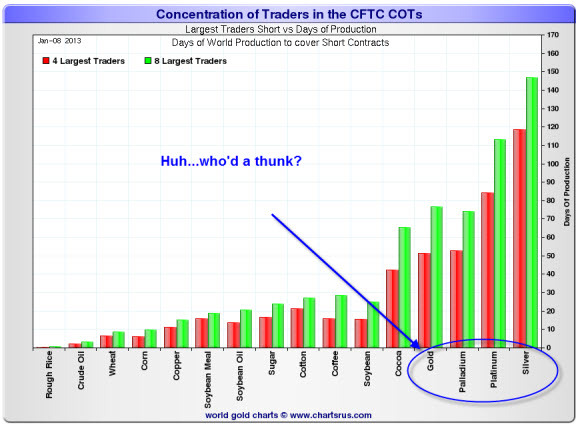 The CFTC rather coyly refers to the bullion banks simply as 'large traders,' but everyone knows that these are the bullion banks. What we are seeing in that chart is that out of a range of commodities, the precious metals were the most heavily shorted, by far. While I am almost 100% certain that any decent investigation by the CFTC would reveal that market manipulating 'dumping' was happening, I am equally certain that no such investigation will occur. That's because the point of such a maneuver by the bullion banks is designed to transfer as much wealth from 'out there' and towards the center, and the CFTC is there to protect the center's 'right' to do exactly that. Two hours later the initial selling, rumored to have been routed through Merrill Lynch's floor team, by a rather more significant blast when the floor was hit by a further 10 million ounces of selling (300 tonnes) over the following 30 minutes of trading. This was clearly not a case of disappointed longs leaving the market - it had the hallmarks of a concerted 'short sale', which by driving prices sharply lower in a display of 'shock & awe' - would seek to gain further momentum by prompting others to also sell as their positions as they hit their maximum acceptable losses or so-called 'stopped-out' in market parlance - probably hidden the unimpeachable (?) $1540 level. 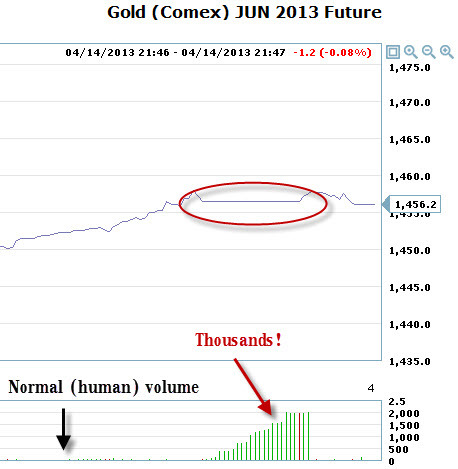 The areas circled represent the largest 'dumps' of paper gold contracts that I have ever seen. To reiterate Ross's comments, there is no possible way to explain those except as a concerted effort to drive down the price. To put this in context, if instead of gold, this were corn we were talking about, 128,000,000 tonnes of corn would have been sold during a similar 3-hour window, as that amount represents 15% of the world's yearly harvest. And what would have happened to the price? It would have been driven sharply lower, of course. That's the point; such dumping is designed to accomplish lower prices, period, and that's the very definition of market manipulation. For a closer-up look at this process, let's turn to Sunday night and with a resolution of about 1 second (the chart above is with 5 minute 'windows,' or candles, as they are called). Here I want you to see that whoever is trading in the thin overnight market and is responsible for setting the prices cannot possibly be human. Humans trade small numbers of contracts and in consistently random amounts. Note that the contracts' numbers, in the single digits to tens, are randomly distributed, and that the scale on the right tops out at 80, although no single second of trades breaks 20. These are just a few of the dozens of examples I captured over a single hour of trading before I lost interest in capturing any more. As I was watching this and discussing it with Adam in real time, I knew that I was watching the sort of HFT/computer-trading robots that we've discussed here so much in the past. They are perfectly designed to chew through bid structures, and that's what you see above. They are 'digesting' all the orders that were still on the books for gold, to remove them so that lower and lower stops could be run. Anybody who had orders up against these machines, perhaps with stops in place, or perhaps even while sleeping because this all happened in the hours around midnight EST, lost and lost big. There is really no chance to stand against players this large with a determination to drive prices lower. At the very least, I take the above evidence of computer-assisted declines of this magnitude to be a sign that our "markets" are completely broken and quite vulnerable to a crash. That the authorities did not step in to halt these markets during such a volatile decline, when they have repeatedly stepped into other markets and individual equity shares on lesser declines, tells me much about the level of official support for such a decline. It also tells me that things are speeding up, and the next decline in the equity or bond markets may happen a lot faster than anybody is expecting. If the intended consequences of this move were to enrich the bullion banks and to chase investors away from gold and other commodities and into stocks, what are the unintended consequences going to be? While I cannot dispute that the bullion banks made out like bandits, I also wonder if perhaps, instead of signaling that the dollar is safer than gold, the banks did not unintentionally send the larger signal that deflation is gaining the upper hand. With deflation, everything falls apart. It is the most feared thing to the powers that be, and for good reason. Without inflation and at least nominal GDP growth, if not real growth, then all of the various rescues and steadily growing piles of public debt will slump towards outright failure and possibly collapse. 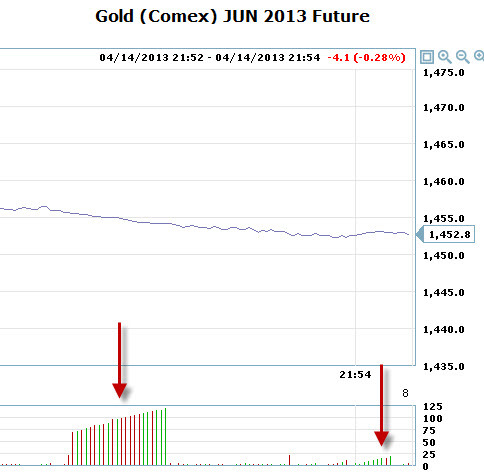 The unintended consequence of dropping gold so powerfully is to signal that deflation is winning the day. If this view is correct, then the current sell-off in gold, as well as in other commodities (detailed in Part II of this report), will simply be the trigger for a loss of both confidence and liquidity in the system, and that will not bode well for the larger economy or equities. In Part II: Protecting Your Wealth from Deflation, we explore the growing signs that the money-printing efforts of the central planners are seeing diminishing returns and are failing in their intended effect to kick global economic growth higher. Deflationary forces appear poised to take the upper hand here, sending asset prices lower – potentially much lower – across the board. If deflation indeed manages to break out from under the central banks' efforts to contain it, even if only for a short period, how bad will the ensuing wave of price instability be? How can one position for it? How extreme will the measures the central banks take in response be? And what impact will that have on asset prices, the dollar, and precious metals? We are entering a new chapter in the unfolding of our economic emergency, one in which the risks to capital are greater than ever. And the rules are increasingly being re-written to the disadvantage of us individuals. The one unfair advantage we have is that history is very clear on how these periods of economic malfeasance end. Let's exploit that as best we're able.